We were fortunate to have been given a lot of older furniture from family members for Baby Carter's nature themed nursery design. We took all the furniture and repainted / repurposed it to match the room's color scheme that includes earth tones and white. To save on decorating costs we collected various logs including a huge 60cm diameter stump that we saw when we went past houses in our neighborhood that were cutting trees. I then used a scumble glazing technique to whiten and bring out the natural grain of the freshly cut wood that we salvaged. A lot of the decorative elements in this room were free-cycled from various sources. I made the bunting from various fabric off-cuts sourced at our local material store. 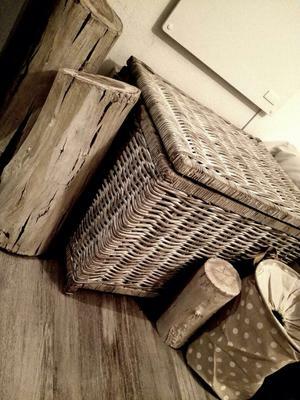 Next, a few boxes of artificial grass were added to bring all of the natural elements featured in the space together. Finally, we bought a fluffy area rug in a cream color for a steal of a price directly from a supplier which served to tie everything up and add a warm, clean, loving vibe. 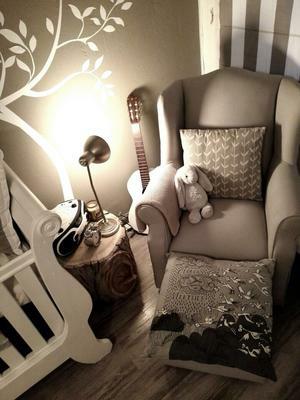 If any of Unique Baby Gear Ideas' visitors have questions regarding colors used or the scumbling painting technique that was used on the logs and large tree stump; please post them using the comments form below. Did you have the personalized tree mural custom made or did you paint it yourself? Could you please post a contact for the vendor if it was a special order? Join in and write your own page! It's easy to do. How? 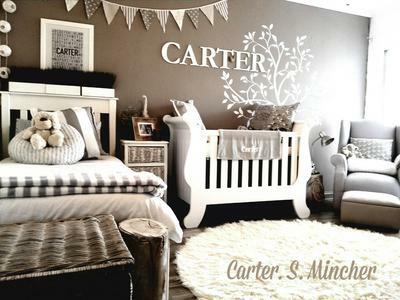 Simply click here to return to FOREST THEME NURSERY PICTURES and DECORATING IDEAS.